Pediatrics is the specialized field of medicine that deals with maintaining and restoring the health of babies, children and teens. 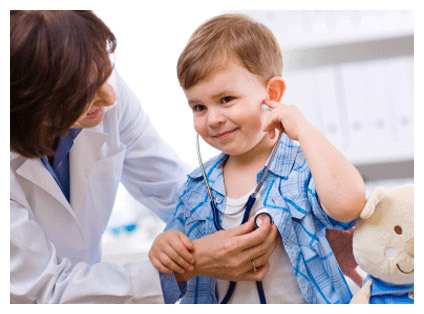 Pediatricians focus primarily on well-child care and preventative measures, such as immunizations and annual check-ups. In addition, a large part of pediatrics practices involve treating common childhood illnesses, such as bacterial and viral infections, as well as injuries and chronic disorders. Pediatric practices may be office-based or hospital-based. Hospital-based pediatricians may be pediatric surgeons or orthopedists, or may specialize in the treatment of life-threatening conditions such as diabetes, cystic fibrosis or epilepsy. General pediatricians complete a two or three year residency in pediatrics, while pediatric sub-specialists train in an additional specialty as well. Neonatal pediatrics is a specialization that deals with the care of newborns who are premature or who have birth defects, as well as for babies who are born with disorders, low birth weight or infections, or who contract illnesses shortly after birth. In addition, neonatal pediatricians, who are also known as neonatologists, monitor and even treat fetuses during the course of high risk pregnancies. In cases of caesarean births, multiple births, high risk pregnancies or fetal distress, neonatologists assist during delivery. Immediately upon the baby’s birth, the neonatologist stabilizes the baby and diagnoses any conditions that are present. The neonatologist then draws up a treatment plan and coordinates the baby’s care with specialists and nursing staff. While most neonatologists work primarily in newborn intensive care units, some continue to care for babies until they are released from the hospital and their care is transferred to a pediatrician. Neonatal pediatricians complete three years of training in intensive care of neonates as well as three years of training in general pediatrics. In the US, they are certified by the American Board of Pediatrics and the Sub-Board of Neonatal-Perinatal Medicine. Much of the equipment used in pediatric practices is standard medical equipment or scaled-down versions of standard equipment such as stethoscopes, ophthalmoscopes and sphygmomanometers. However, neonatal intensive care units must be fully equipped with incubators, warmers, phototherapy lights, ventilators and additional specialized equipment.